This page contains miscellaneous findings of interest that illustrate some minor aspect of piping in North Shields, or hold information, anecdote or “pointers” that at present can not be followed up. In some cases they are simply curious. 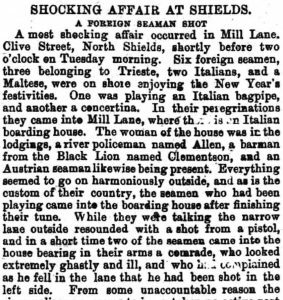 The stolen pipes may have been either small-pipes or border pipes, but the player is identified (William Fitzheugh) as is the perpetrator, and the account confirms that people travelled considerable distances to Fairs at this time – Stagshaw Bank is about 25 miles from North Shields, but clearly both parties made the journey. The victim died the following day. 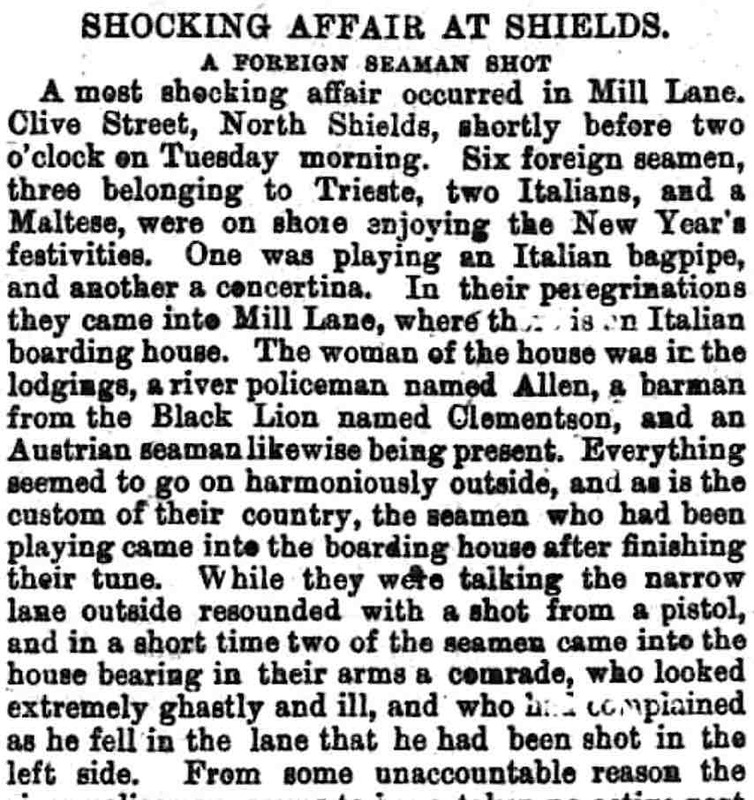 Late in the evening on the day of the shooting police apprehended an Italian man. The coroner’s jury returned a verdict of “Wilful Murder” against the prisoner. The Black Lion Inn stood on the south side of Clive Street at the west end of the street, immediately east of the New Market. Over a century earlier than this incident, in the late 1760s the landlord was John Gilley, and the inn was the venue for several auctions in which both ships cargoes and sometimes ships themselves, were sold. In 1828 the innkeeper was a John Lawson. 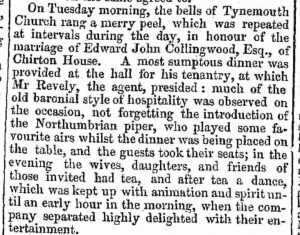 In 1842 James Reid, Elizabeth Reid and Thomas Chisholm are known to have been playing pipes in North Shields, and probably James Fenwick as well. The piper at the wedding is not identified but if it is a local piper then James Reid and Thomas Chisholm are the most likely possibilities. 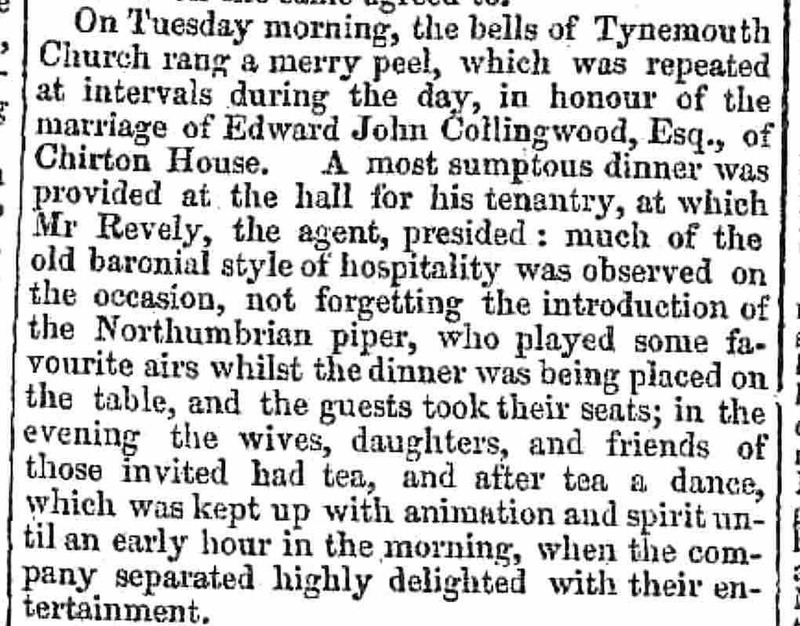 This is only two years before Thomas Chisholm was appointed Manorial Piper for Tynemouth, and at a time when James Reid was describing himself as a musician and music teacher – both would be known in the area. The agent, Mr Revely, has not yet been researched, but it may be significant that James’ sister Isabella married a man called William Revely (also spelt Reveley), a chain-maker, and later in his life James gave a manuscript music book to his nephew Robert Reid Reveley.